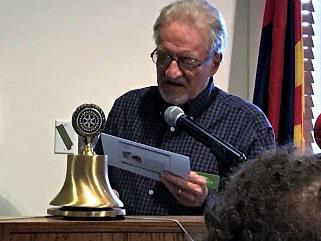 The March 26, 2018 meeting of the Sierra Vista Rotary club welcomed Chairman of the Board for Canyon Vista Medical Center, Mr. Bruce Dockter. Bruce was a fellow club member for many years. We also welcomed our Student of the Month, Travis LaMacchia. Travis did a great job in his address to the club. His interpretation of the "Four-Way Test" was inspiring and he has pledged to be honest and to plan his life by the things he thinks, says, and does: going forward using self-reflection in order to plan in the future how to use good judgment with people and al-ways keep in mind how to make a difference. His speech is representative of our future generation’s youth stepping into leadership roles. Mr. Bruce Dockter of Canyon Vista Medical Center advised us that for 50+ years the community hospital has been a mainstay and they have encouraged the continuing medical development in our area. Mr. Dockter explained about Capella being a partner and how the hospital chose to be a "for profit" in lieu of a nonprofit. This decision was carefully weighed and made by trying to identify the most appropriate steward-ship of all funds, by lowering reimbursement costs to patients, while increasing revenue dollars to the local hospital. The Canyon Vista medical center placed approximately $1.3 million annually to the County and Cities general fund last year. Canyon Vista Medical Center together with its Board of Directors entered into a 40-year management agreement together with community partners the Legacy Foundation. Working together they make and approve changes that directly benefit us who reside here in the area. Some highlights of the board’s mission are to focus on safety and quality patient care, patient safety, increased performance times, and community outreach. Mr. Dockter asked the club that if ever something were to occur, and they or someone they knew felt they had a negative experience, to please approach any of the trustees on the board first in order for them to obtain the information and address it and to do better. Mr. Dockter further went on to describe how the mission leads into having strong emergency room services, strong triage department and quick referrals. Streamlined operational guidelines have reduced patient wait times by more than 50% across-the-board. 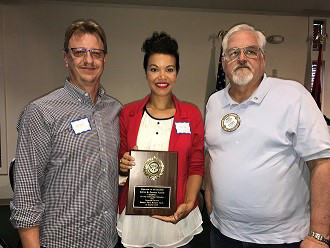 Karina Rice Roberts, International Director and Committee chair, presented the sign-up sheet, event profile, and agenda for the upcoming picnic and international Fellowship day with the Agua Prieta, Sonora, Mexico Rotary Club. 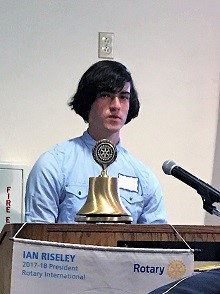 Sierra Vista Rotary Club has been gaining more participation from club members to attend. 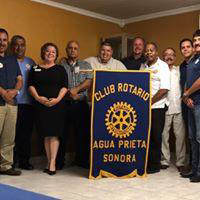 We look forward to Saturday, April 14, 2018, from 10 AM to 6 PM to share in Rotary International fellowship and seeing firsthand how our international district grants operate and exactly how our club’s sponsorship dollars are used to make a difference in the lives of the children of Agua Prieta, Sonora, Mexico.